A couple of months ago I had already signalled the absurdity of such a corporation warning the most populous country in the world (India) against spreading politically-motivated messages in THEIR OWN ELECTION. “We hope”? Excuse me Facebook, but who the hell are you to “hope”? You must avoid like the plague being close of “future abuse in elections”. Not “hope”. Regardless of Facebook’s good faith in these matters (ignoring, that is, their (now 15 year not-so-good record the same field): what we have here is a corporation settings the rule of political propaganda and information to, and inside, a sovereign state. What we have here is something that, if a government were doing it, would be likely called censorship, period. Less than two months from now there will be the EU-wide elections of the European Parliament, and Facebook is doing it again: “thoughening ITS rules on political ads” in order to “guard against foreign meddling in [EU’s] upcoming legislative election”. Clear, isn’t it? 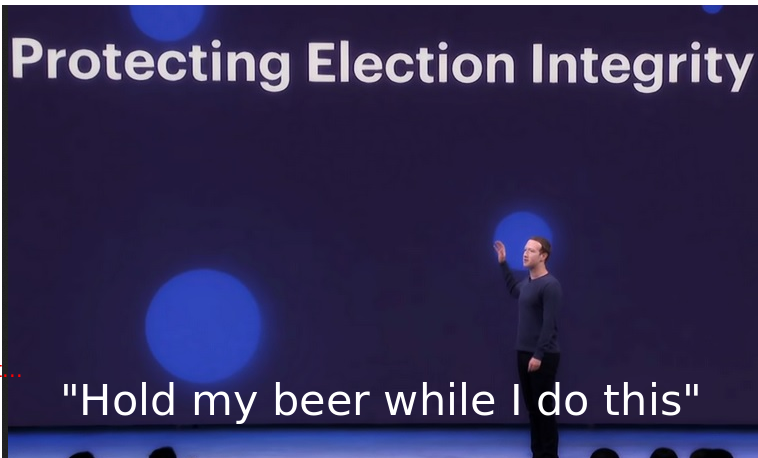 Only Facebook itself is allowed to meddle into legislative elections, or, in any case, will remain hardly accountable for that. The only thing more ironic than this? Easy! The fact that that “promise” is made to the same MEPs that, just a few days ago, approved a new Copyright Directive that (paraphrasing) “will make #Facebook and others behave, at last”. The only serious rule I can think about political ads inside social network as such would be banning them outright, period. I am aware myself that this would not solve the “meddling” problem, and that it would have consequences hard to define in advance. But I still feel it would make much more sense than letting Facebook (or YouTube, Google etc..) do whatever they want as it happens today. « What if who decides what you see online were your father?